We offer a great range of accessories including tyre valves, flaps, o-rings, sealant liquids, fitting equipment & fitting accessories. Please contact us with your requirements on 01159 940 900, or live chat or message us & we will be glad to help! We sell separate snap-in and clamp-in valves for tubeless tyres which you can BUY ONLINE HERE. For advice on which valve is suitable for your tyre, or for pricing on valves not listed, please Contact Us. Generally speaking car, trailer, lawn mower & quad tyres use the TR13 snap in valves. 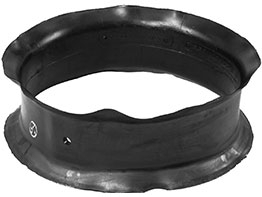 Larger agricultural tyres use the TR15 snap in valves, or a TR218 clamp in Air/Water valve. We sell flaps in most common sizes for forklift and OTR machinery which you can BUY ONLINE HERE. For advice on which flap is suitable for your tyre, or for information on flaps not listed, please Contact Us. Generally speaking flaps are used on split rims, and cover the split to avoid it catching or pinching the inner tube used within the tyre. Flaps are used on almost all pnematic forklift tyres, and on older military or vintage bus & trucks. They are often also found on large earthmover or mining wheel rims. 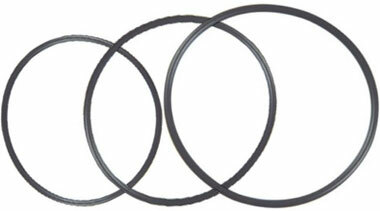 We sell O-Rings in most common sizes for Grader. Earthmover & OTR machinery which you can BUY ONLINE HERE. For advice on which o-ring is suitable for your tyre/rim, or for pricing on o-rings not listed, please Contact Us. O-Rings are located in a groove between the rim & bead seat ring to create an air seal on 3 & 5 piece grader, earthmover and OTR wheel rims. The THICK o-ring versions tend to be 9.5mm or 3/8" in their cross section, whilst the THIN variants are around 6.5mm or 1/4" in cross section..
Tyre Sealant is another great puncture-prevention solution! Tyre Sealant is pumped into agricultural, industrial and construction tyres to seal punctures as soon as they happen, preventing leaks and keeping you moving. Tyre Sealant is cheaper than foam filling and keeps air in the tyre for a lighter ride. 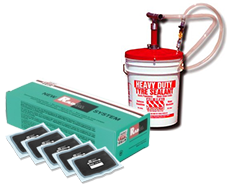 View more details & BUY TYRE SEALANT HERE. For turf and lawn applications we also offer Aramid Belted and Kevlar Belted tyres which have a robust liner included that makes them more puncture resistant & cost-effective. Please Contact Us for more information on these products. We also offer our Foam Filling Service for some tyre types which makes your tyre into a solid puncture proof unit. If you run a tyre shop, are starting a mobile fitting business, or simply need an extra tool or two around the home, Big Tyres can supply the gear your need. With Bead Blasters from as little as £99 you will be able to turn one the most frustrating & time consuming jobs into one of the quickest & easiest, seating & inflating your tyres in next to no time! Our range of lever-less tyre changing machinery are some of the most robust and easiest to use on the market. Safe, reliable and hassle free they do away with the need for a tyre lever and make damage to tyres and wheels during fitting a thing of the past! 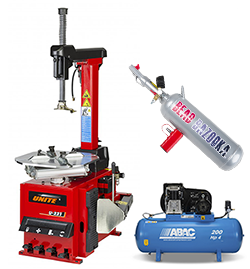 Our wide range of compressors are available in screw, belt drive and petrol options, providing for those needing a small but reliable workshop model, right up to those tackling the most demanding of air compression tasks. Currently our full range of equipment is not listed online to buy, so please contact us with your requirements. Repair patches can be an affordable way to keep your tyres and tubes going that little bit longer. Sold by the box Big Tyres offer both Radial and Cross Ply patches for durable repairs to your Radial and Crossply tyres. Our inner tube patches are also designed to repair small injuries to your inner tubes. 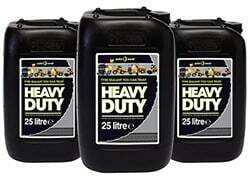 Tyre mounting pastes and waxes are available in 5kg tubs to help get your tyres on your rims, and a range of other items are also available on request. Our items are not listed to buy online so please contact us with your requirements.